Individual service usage and cost: AWS pricing is based on your usage of each individual service. The total combined usage of each service will create your monthly bill. Explore the tabs below to learn what each service does and how it effects your bill. Description: AWS CodePipeline is a continuous delivery service for fast and reliable application updates. 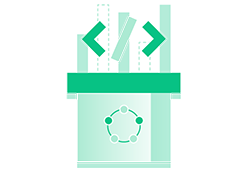 CodePipeline builds, tests, and deploys your code every time there is a code change, based on the release process models you define. This enables you to rapidly and reliably deliver features and updates. You can easily build out an end-to-end solution by using our pre-built plugins for popular third-party services like GitHub or integrating your own custom plugins into any stage of your release process. With AWS CodePipeline, you pay only for what you use. There are no upfront fees or long-term commitments. How Pricing Works: AWS CodePipeline charges $1 per active pipeline per month. An active pipeline is a pipeline that has at least one code change that moves through it during the month. You may incur additional charges for storing and accessing your pipeline artifacts in Amazon S3 and for triggering actions from other AWS and third party services that you connect to your pipeline. The AWS Free Tier allows you one active pipeline per month for free. Example: If you have three pipelines but only one has had a code change move through it in a month, then you would be charged only $1 for that month. The AWS Free Tier allows you one active pipeline per month for free. The idle pipeline is not charged for that month. Description: AWS CodeDeploy is a service that automates code deployments to any instance, including Amazon EC2 instances and instances running on-premises. AWS CodeDeploy makes it easier for you to rapidly release new features, helps you avoid downtime during application deployment, and handles the complexity of updating your applications. You can use AWS CodeDeploy to automate software deployments, eliminating the need for error-prone manual operations. The service scales with your infrastructure, so you can easily deploy to one instance or thousands. How Pricing Works: There is no additional charge for code deployments to Amazon EC2 instances through AWS CodeDeploy. You are charged only for code deployments to on-premises servers at the rate of $0.02 per on-premises server update. For example, a deployment to three on-premises servers equals three updates. Example: If you deploy code to one Amazon EC2 instance using AWS CodeDeploy, then there is no charge. If you deploy code to one on-premises server, then it would cost $0.02. Description: : Amazon EC2 provides the virtual application servers, known as instances, to deploy your code changes on. Amazon EC2 allows you to configure and scale your compute capacity easily to meet changing requirements and demand. It is integrated with Amazon’s proven computing environment, allowing you to leverage the AWS suite of services. How Pricing Works: Amazon EC2 pricing is based on four components: the instance type you choose (EC2 comes in 40+ types of instances with options optimized for compute, memory, storage and more), the region your instances are based in, the software you run, and the pricing model you select (on-demand instances, reserved capacity, spot, etc.). For more information, see Amazon EC2 Pricing. Example: If you follow the Simple Pipeline Walkthrough in the Implementation Guide and accept the default values, then you would launch one t1.micro instance running Amazon Linux. If you kept the instance running for one full month, then your total cost for the month would be $15 (assuming you are not within Free Tier limits). Description: AWS CodeCommit is a fully-managed source control service that makes it easy for companies to host secure and highly scalable private Git repositories. CodeCommit eliminates the need to operate your own source control system or worry about scaling its infrastructure. You can use CodeCommit to securely store anything from source code to binaries, and it works seamlessly with your existing Git tools. How Pricing Works: The cost of hosting your project with AWS CodeCommit depends on the number of active users in your account each month. Your account gets 5 active users per month for free (within limits), after which you pay $1 per additional active user per month. There are no upfront fees or commitments. For further details, see AWS CodeCommit Pricing. Example: If your account has 6 active users in a given month, then you would be billed $1 (assuming no additional charges or overages). You can use CodeCommit as the source repository in your pipeline. How Pricing Works: Amazon S3 Pricing is based on five components: the type of Amazon S3 storage you use (e.g. Standard vs. Standard-Infrequent Access), where you store your objects (e.g. US East vs. Asia Pacific - Sydney), the amount of data you store, and the number of requests made to store or retrieve objects, and data transfer fees. For more details, see Amazon S3 Pricing. Example: Let’s say you are using Amazon S3 Standard Storage in the US East (N. Virginia) region. Using the guide’s sample code, you would store <1 MB of source files which costs a negligible amount ($0). Whenever AWS CodePipeline retrieves a copy of your source file from S3 or downloads an artifact to the artifact bucket, you are charged for S3 request pricing on a per request basis (e.g. PUT, COPY, POST, and GET requests). You can use S3 as the source repository in your pipeline. CodePipeline will also use S3 to store and access pipeline artifacts. Total Billing Estimates: The total cost of running a CI/CD pipeline on AWS depends on the AWS services used in your pipeline. Monthly charges will vary on your configuration and usage of each product, but if you follow the step-by-step instructions in this guide and accept the default configurations, you can expect to be billed around $15 per month.